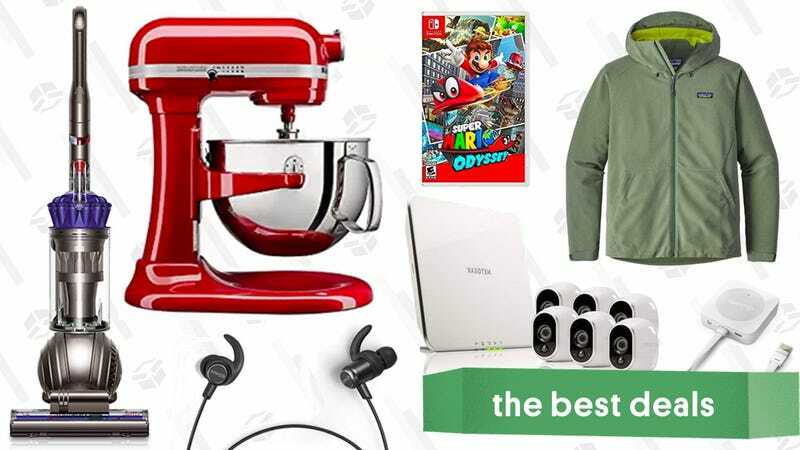 Snag deals on a quintessential KitchenAid mixer, a six-camera security system, $75 off a Dyson ball vacuum, and the rest of the best deals the internet has to offer. Netgear’s popular Arlo home security system is a lot like Nest Cam, except the cameras can run off battery power, so you really can stick them anywhere. If that sounds like something you’re looking for, Amazon will sell you a six-camera starter kit for $400, an all-time low, and a whopping $150 less than usual. These Herschel Supply Co bags would normally set you back around $80, but select colors are marked down between $60 and $64 today, so you can pack for your next weekend getaway for less. They all include an internal storage pocket for shoes, a waterproof zipper, and a padded shoulder strap. Tied for cheapest, the black palm bag is only $60, this plain black bag is just $61, and my favorite, the wine/tan bag is just $60 as well. These deals might not last long, so head over to Amazon if you need a new bag. If you already own a Dremel, you can make it do a lot more with this 282 piece accessory kit from Tacklife. Tucked into the carrying case, you’ll find accessories for sanding, grinding, cutting, polishing, and a lot more. Just use promo code 8RL7WQZW at checkout to get it for $18. If you want to do any electrical work around your house, you need to have a multimeter in your toolbox. This one’s only $9 with promo code 3P8TMFOK, just please, please be careful. Next time there’s a storm, you could spend $5 on a drugstore umbrella that will last approximately 40 seconds before disintegrating into flying shards of metal, or you could invest in a Blunt umbrella for 20% off with promo code WUOINIVO. This deal is valid on the full-sized Blunt Classic and the portable Blunt Metro. The code should work for any color as long as it’s sold by BLUNT USA - it won’t work on listings sold by Amazon directly. Get caffeinated with this 20% off coupon on 12 packs of Starbucks Doubleshot espresso drinks. They have two espresso and cream drinks (both light and regular) and a pack of Cubanos, which has cream and sugar. Hell yeah, guys, it’s porch swing season! This swinging bench includes a canopy for shade, and in a major twist, can fold down into a flat, hammock-like outdoor bed. Save $50 at checkout with promo code HEAVYDUTYSWING to get it for just $120, with free shipping. Keep your backseat passengers entertained with this car headrest tablet and phone mount. It snaps into the metal bars in the headrest and can hold most tablets and phones. Use code MOUNT888 to get it for just $8. You can workout at home without a bunch of bulky weights taking up space with these PowerBlock adjustable dumbbells. They’re on sale on Amazon today, and they’re basically like buying a whole free weight set with the footprint of just two dumbbells. Each dumbbell adjusts to 16 different weights, ranging from 2.5 to 50. This set usually sells for around $300, so today’s $251 is worth checking out. From the opening line of his breakthrough cyberpunk novel Snow Crash, Neal Stephenson plunges the reader into a not-too-distant future. It is a world where the Mafia controls pizza delivery, the United States exists as a patchwork of corporate-franchise city-states, and the Internet—incarnate as the Metaverse—looks something like last year’s hype would lead you to believe it should. Enter Hiro Protagonist—hacker, samurai swordsman, and pizza-delivery driver. When his best friend fries his brain on a new designer drug called Snow Crash and his beautiful, brainy ex-girlfriend asks for his help, what’s a guy with a name like that to do? He rushes to the rescue. A breakneck-paced 21st-century novel, Snow Crash interweaves everything from Sumerian myth to visions of a postmodern civilization on the brink of collapse. Faster than the speed of television and a whole lot more fun, Snow Crash is the portrayal of a future that is bizarre enough to be plausible.ilable to new subscribers only. Nintendo’s AA Joy-Con battery grips allow your controllers to run for longer on a charge, yes. But just as importantly, they make them a lot more comfortable to hold. Get a set for an all-time low $12, and throw a few rechargeable AAs in your cart while you’re at it.